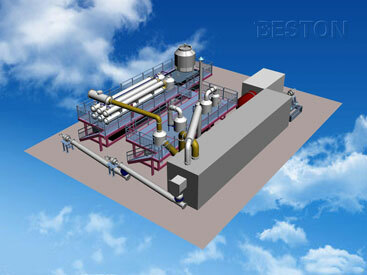 Beston fully continuous pyrolysis plant, with large capacity of 20-24t/d, is the high-end product of our company. 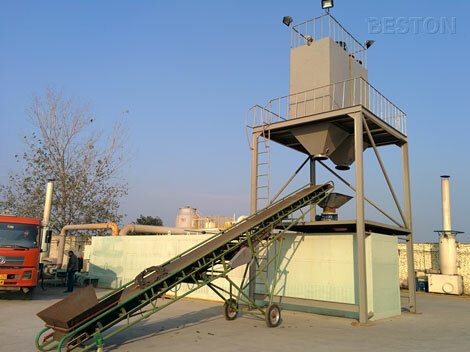 It can dispose various kinds of waste materials, such as waste tyre/plastic/rubber, oil sludge, medical waste, etc. 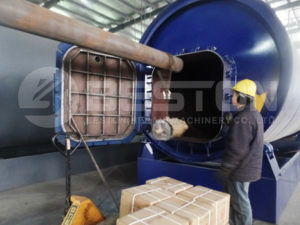 Before entering pyrolysis process, the waste materials need pre-treatment. 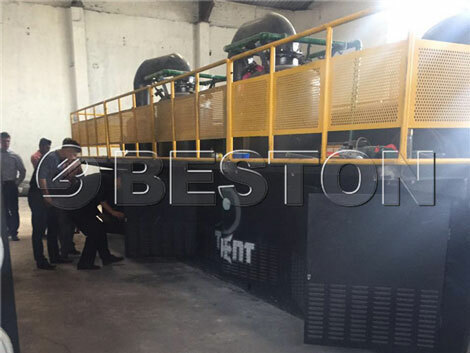 It needs a tyre shredder machine to crush the tyres into 30-50mm pieces; if the plastic is large and rigid, it also needs to crush the plastics; if the humidity of plastics and medical waste is higher than 15%, it needs a dryer; the medical waste also needs disinfection. Feed the waste materials (having been pretreated) into reactor. Seal the feeding inlet door tightly and make sure there is no gas leakage. Heat the pyrolysis reactor by using coal, charcoal, fuel gas, wood etc. as heating materials. The reactor will be slowly heated, and when the temperature reaches about 250℃, the oil gas will be formed. The oil gas coming out from the reactor then goes to condensing system and becomes liquid oil. We adopt new-type condenser which can improve the oil yield efficiency and make the oil yield to the maximum. The gas which can’t be liquefied under normal pressure will be designed to go back to combustion system through safety device. It can be recycled to heat the reactor as fuel, which will save energy for the whole working process. The carbon black and steel wire (only for tyres) are discharged automatically while the waste materials are fed into reactor. Tyre oil 1. Can be widely used as industrial fuel materials for burning. 2. If further refined to diesel or gasoline by waste oil distillation machine, the oil can be used in low speed engines such as digging machine, road roller or loading machine, etc. 3. It can help in relieving energy crisis. Carbon black 1. The carbon black can be used for construction bricks with clay or used as fuel. 2. 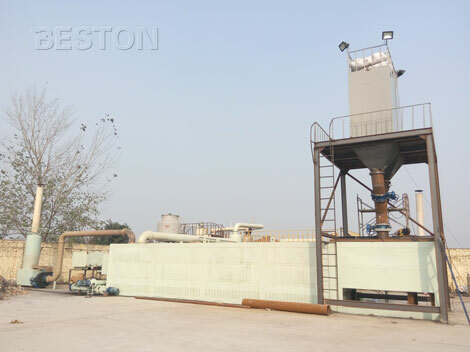 If further processed by Beston carbon black processing plant, the carbon black can be deep processed into N220, N330 Carbon black, which has higher value and wider applications. 3. It can be made into pellet or briquette for burning, or further processed into color master batch as basic material to make pipes, cable jacket etc. Steel wire (only for tyres) Can be reprocessing or used to make steel and iron rod. 2. Both of the feeding of materials and discharging of carbon black and steel wire (only for tyres) are automatic. The fully continuous pyrolysis plant for sale can achieve feeding raw materials on one side and discharging carbon black and steel wire continuously on the other side at the same time. 3. The reactor of our auto operating pyrolysis plant is stable and not rotary, which makes the temperature rise and pyrolysis react quickly. This special design makes the whole pyrolysis process efficient and can also save much heating materials. 4. The fully automatic pyrolysis plant can work continuously for 24 hours per day without a stop and needn’t to be cooled before the second batch. It can not only save manpower, but also improve working efficiency greatly. 5. We have designed three models of the fully continuous plant, BLL-20 (20-24t/d). If you have any special requirement, we can also customize the plant for you.